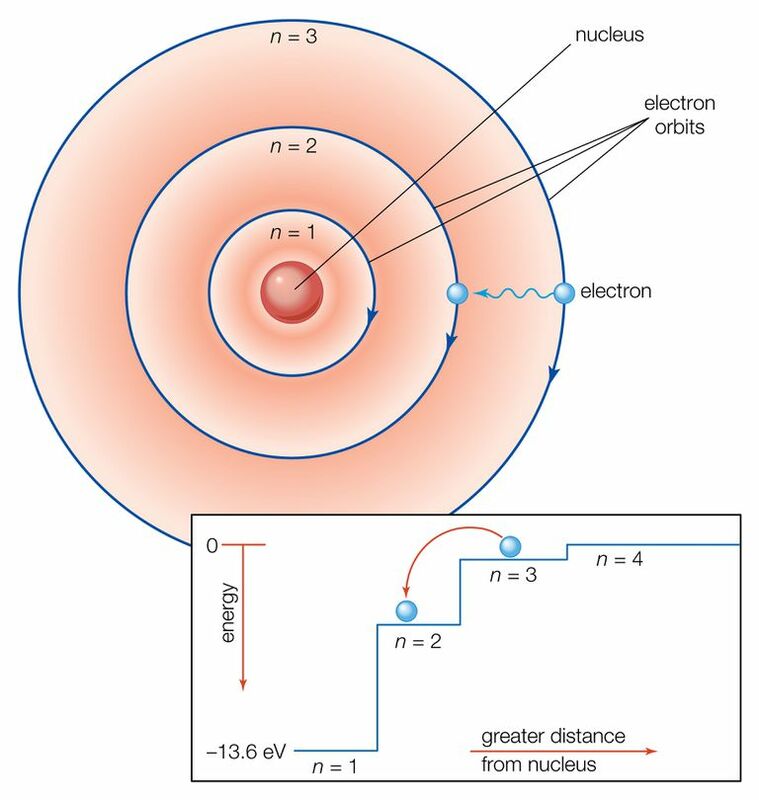 The Bohr Model has an atom consisting of a small, positively-charged nucleus orbited by negatively-charged electrons. Here's a closer look at the Bohr Model, which is sometimes called the Rutherford-Bohr Model. Niels Bohr proposed the Bohr Model of the Atom in 1915. Because the Bohr Model is a modification of the earlier Rutherford Model, some people call Bohr's Model the Rutherford-Bohr Model. The modern model of the atom is based on quantum mechanics. The Bohr Model contains some errors, but it is important because it describes most of the accepted features of atomic theory without all of the high-level math of the modern version. Unlike earlier models, the Bohr Model explains the Rydberg formula for the spectral emission lines of atomic hydrogen. The Bohr Model is a planetary model in which the negatively-charged electrons orbit a small, positively-charged nucleus similar to the planets orbiting the Sun (except that the orbits are not planar). The gravitational force of the solar system is mathematically akin to the Coulomb (electrical) force between the positively-charged nucleus and the negatively-charged electrons. Electrons orbit the nucleus in orbits that have a set size and energy. The energy of the orbit is related to its size. The lowest energy is found in the smallest orbit. Radiation is absorbed or emitted when an electron moves from one orbit to another. The simplest example of the Bohr Model is for the hydrogen atom (Z = 1) or for a hydrogen-like ion (Z > 1), in which a negatively-charged electron orbits a small positively-charged nucleus. Electromagnetic energy will be absorbed or emitted if an electron moves from one orbit to another. Only certain electron orbits are permitted. The radius of the possible orbits increases as n2, where n is the principal quantum number. The 3 → 2 transition produces the first line of the Balmer series. For hydrogen (Z = 1) this produces a photon having wavelength 656 nm (red light). Heavier atoms contain more protons in the nucleus than the hydrogen atom. More electrons were required to cancel out the positive charge of all of these protons. Bohr believed each electron orbit could only hold a set number of electrons. Once the level was full, additional electrons would be bumped up to the next level. Thus, the Bohr model for heavier atoms described electron shells. The model explained some of the atomic properties of heavier atoms, which had never been reproduced before. For example, the shell model explained why atoms got smaller moving across a period (row) of the periodic table, even though they had more protons and electrons. It also explained why the noble gases were inert and why atoms on the left side of the periodic table attract electrons, while those on the right side lose them. However, the model assumed electrons in the shells didn't interact with each other and couldn't explain why electrons seemed to stack in an irregular manner. It violates the Heisenberg Uncertainty Principle because it considers electrons to have both a known radius and orbit. The Bohr Model provides an incorrect value for the ground state orbital angular momentum. It makes poor predictions regarding the spectra of larger atoms. It does not predict the relative intensities of spectral lines. The Bohr Model does not explain fine structure and hyperfine structure in spectral lines. It does not explain the Zeeman Effect. The most prominent refinement to the Bohr model was the Sommerfeld model, which is sometimes called the Bohr-Sommerfeld model. In this model, electrons travel in elliptical orbits around the nucleus rather than in circular orbits. The Sommerfeld model was better at explaining atomic spectral effects, such the Stark effect in spectral line splitting. However, the model couldn't accommodate the magnetic quantum number. Ultimately, the Bohr model and models based upon it were replaced Wolfgang Pauli's model based on quantum mechanics in 1925. That model was improved to produce the modern model, introduced by Erwin Schrodinger in 1926. Today, the behavior of the hydrogen atom is explained using wave mechanics to describe atomic orbitals. Linus Carl Pauling (1970). "Chapter 5-1". General Chemistry (3rd ed.). San Francisco: W.H. Freeman & Co. ISBN 0-486-65622-5.